Friend and colleague, Alana Loren, has a new suspense novel out and I am thrilled to be able to share a bit about her new book. Teo Haroun and the other lawyers in his firm look forward in varying degrees to the retreat at the Sherman Ranch in northern New Mexico. The boss has laid down some rules—no phones, no computers, no communication with the outside world—that makes them uneasy. But the corporate team-building exercises are necessary for this firm to survive its inner sniping and turmoil—and to protect the secrets they hold. Inez Suela and thirty other Mexicans have paid a coyote hundreds of pesos to take them across the border into the United States, where they hope to make a better life. The crowded truck heads north into New Mexico to meet their local driver, the occupants unaware that a freak March snowstorm is waiting in its path. Jake Patrin, the caretaker of the Ranch, fights demons of his own as he struggles daily with addiction. Working far from the city on the lonely Ranch, hosting those who rent the facility, is his protection and solace. But he’s about to lose the only peace he’s been able to grasp. Davi Pilar needs to make some fast money to appease a couple of St. Louis loan sharks, so he agrees to pick up a truckload of illegals and take them to St. Louis. He drives to New Mexico, not knowing that someone from his past is on that truck. The intersection of these people, the collision of their cultures, the revelation of their mysteries—all these things lead to violence, death, and even redemption in their New Mexico ENCOUNTER. Davi Pilar checked his truck and slammed the back door closed. Everything was ready. Sitting on the concrete step outside the building where he rented a two-room flat, he scanned up and down the street. Couldn’t be too careful. It’s why he had put the holes in the top of his box truck, instead of the front or sides. His pollos could get the air they needed and the casual passerby wouldn’t wonder why the truck had been altered. He didn’t want to lose the lifestyle he had coming to him, not for carelessness. Davi might only have two rooms, but he had three times the possessions he’d ever owned in Juarez, and better ones. He had a full size refrigerator that dispensed cold water and ice from the door. He owned a top-flight stereo and huge speakers. His bed pillow was of polyester instead of old feathers, and his bedspread looked like black and red satin. He bought good whiskey, nothing smuggled any more, and top-name commercial tequila, much better than what his cousin used to bring in from the backlands. The next scheduled acquisition on his list was a big-screen television, big like a movie screen. None of his family had ever had a big-screen television. He’d get hi-def, be able to watch the football games better than anyone. Once he scored this drop, he’d have the money. The night before, Tonio’s brother Juan called to let Davi know the truck was on its way to New Mexico. It was time for Davi’s part. Tonio’s fat hermano promised that Tonio had Davi’s money, that it had been a good crop of human cargo, the truck full of those bound for El Norte. “Who? Who is it?” Davi kicked the leg of his heavy sofa in his agitation, muttering curses as the pain shot through his foot and leg. “You’ll see, compadre. Maria needs me now. Meet them tomorrow night. Hasta la luego!” The line went dead. Davi brooded about that cryptic warning even now, sitting on the step. Who might be coming? One of the men he’d crossed before he’d left town? The husband of his sister, who had threatened him after Davi had taken her small savings? He’d burned a lot of bridges when he’d left Mexico for the North. It could be anyone. When he left later that night, he took two handguns and a rifle. Just in case. 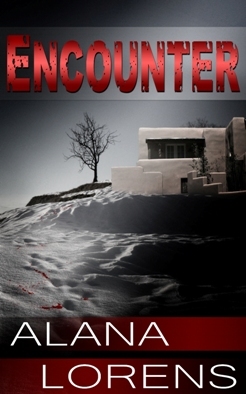 Available now in both ebook and print formats, an intrepid reader can find ENCOUNTER at Amazon.com and at Three Fates Press, with other formats and venues on the way. Thanks to Tony Acree for letting me crow a little today!